One of sailing’s greatest joys comes from experiencing the sounds of the wind and the water as you cruise along. When you need to pilot the vessel under power, engine noise can detract from the experience as well as affect your ability to communicate on deck or sleep below. Over the past 30 years, Soundown has developed extensive experience in reducing noise aboard sailboats. We’ve used that experience to develop this list of recommendations for dealing with the most common noise sources. While no two boats are exactly the same, this list will get you on course towards a quieter vessel and a more enjoyable boating experience. The treatments below have proven effective on a wide range of sailboats. Each treatment description includes recommended materials as well as the path it will treat (airborne and/or structureborne) and the areas of the boat where it will be most effective. 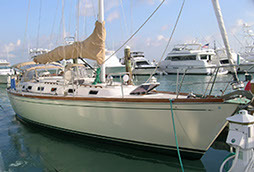 Problem: The layout of most sailboats places the engine space right next to the galley, aft or midship berths, and below the cockpit. The interior paneling that separates the engine from the living areas is often thin and does not provide a good sound barrier. Barrier composite insulation on the overhead and bulkheads. Barrier composites sandwich a layer of mass-loaded vinyl with acoustic foam. The foam absorbs noise while the mass-loaded layer reflects noise back into the engine room, protecting accommodation areas. Soundown’s IVF (insulated vinyl/foam) composite sheets are highly effective aboard most vessels and are easy to install in new builds or during refit. On many sailboats, the engine compartment is open below deck (bulkheads do not extend to the bilge) allowing noise to travel forward and aft, then transmit through the uninsulated deck. If it’s not sealed all the way down to the bilge, we recommend extending the box with fiberglass or plywood so it is sealed down to the hull. 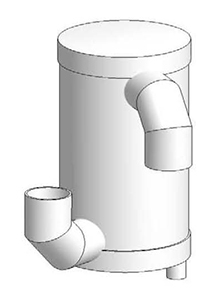 The extension should also be insulated with barrier composite (as described above). For vessels that spend a significant amount of time at sea, quilted fiberglass provides acoustic insulation that also meets relevant fire safety standards. The scrim and facing add cohesion to the fiberglass, which helps with fire resistance and makes the material easier to work with. 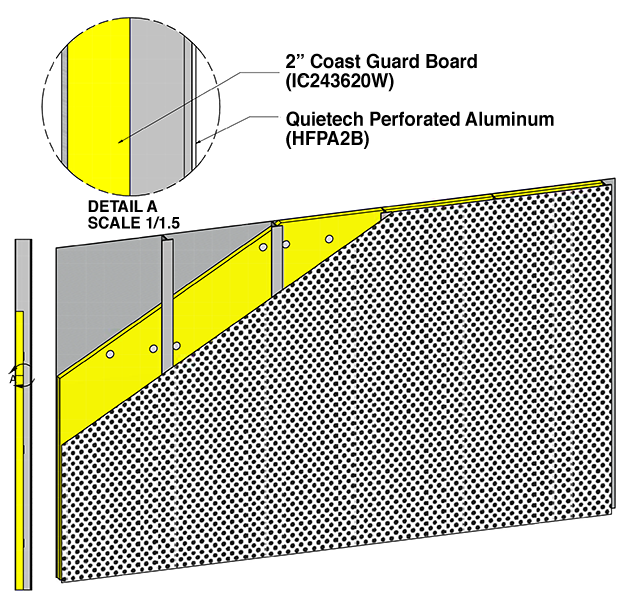 For a high level of finish and additional noise reduction, Soundown QuieTech perforated aluminum sheets can be installed over the insulation. Vibrational energy from the engine is transmitted through to the stringers and travels throughout the vessel. This energy radiates off of soles, bulkheads, and decks as structureborne noise. The range of these frequencies fall, for the most part, outside human hearing. This means that the vibrations which cause structureborne noise are not something you will feel by standing on the deck or touching a bulkhead. But you will hear the resulting sounds from that vibration. Isolation Mounts for the engine. Mounts decouple the engine from the hull, isolating a significant amount of vibration. Space constraints usually mean that the engine and gear boxes are close coupled, so a mount that can handle the force of the propeller thrust is needed. Soundown AMC Marine mounts provide a low vertical stiffness with high longitudinal stiffness to effectively isolate the engine, while handling engine thrust. Selecting the right mount depends not only on the weight of the engine, but also on the horsepower and torque. Please fill in the mounting system data sheet (link) so that we may select the best mounting solution for your application. Problem: Energy created by the meshing of gear teeth transmits down the propeller shaft, creating “gear whine.” This noise is high frequency and does not add to the dBA level (measure of overall loudness), however, the tonal nature of this noise is extremely irritating. Soundown’s RD flexible shaft coupling uses rubber elements to break this transmission path. Once the shaft is isolated, gear vibration cannot travel into the hull, eliminating gear whine. For vessels over 65’ please refer to our yachts under 110’ section for details. Problem: Even vessels equipped with basic mufflers experience significant levels of exhaust noise on deck. Solutions: Soundown’s range of Waterdrop silencers are custom built for each installation and tuned to the specific frequency of your engine. With noise reduction as high as 25dBA, wind and water noise become the dominant sounds at cruising speed. At slower speeds, deck areas become much more comfortable. Problem: Machinery noise that is transmitted into the accommodation areas of the boat will reverberate off hard surfaces such as bulkheads and overheads. This amplifies the noise in the cabin and can make communication difficult. This effect is similar to the “reverb” that happens in a completely empty room, as compared to one with a carpet, curtains and other soft, sound-absorbing finishes. Lining the overheads and bulkheads with Soundown Hull and Headliner reduces noise in the cabins by absorbing instead of reflecting. This material is available in white, off-white and perforated white finish, which provide bright and cleanable surfaces.